Matthew Summerfield (14), Baxter Poulson (13), Head coach Steele French (with daughter Ocean) Aidan Jardim (12) and Diaz Gizzarone (14). FOUR young members from a Samson based taekwondo club have come away with medals at the recent 2019 Australian Cadet Team Selections. The French’s Martial Arts team travelled to Brisbane earlier this month for the event, where they competed against some of the best from around the country. Fourteen-year-old Matthew Summerfield and 13-year-old Baxter Poulson returned from the competition with gold medals, both earning selection to the Australian team in the process. Teammate Diaz Gizzarone (14) won a silver medal for her efforts, while Aidan Jardim (12) competed strongly in his division. 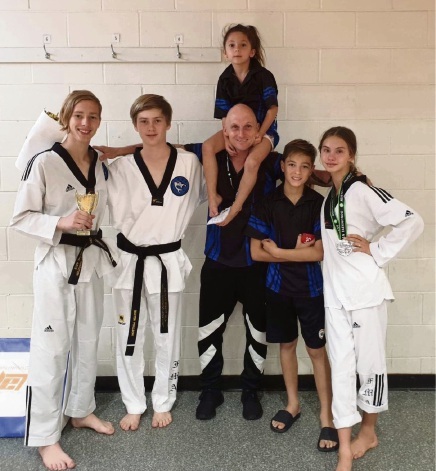 Coach Steele French said he was extremely proud of the quartet’s efforts, with Baxter and Matthew now turning their attention to the Taekwondo World Cadet Championship in Uzbekistan later this year.